Mini Countryman Performance, Engine, Ride, Handling | What Car? A range of turbocharged petrol and diesel engines are available, plus a plug-in hybrid. You can also spec All4 four-wheel drive with each engine, and all apart from the hybrid get a choice of manual or automatic gearboxes. The cheapest option is the 1.5-litre petrol. Unfortunately, with only 134bhp and 243lb ft of torque, this engine feels rather underpowered. It may be gutsy enough to give the Mini hatchbacks lively performance, but it makes the heavier Countryman feel rather languorous. With it filled to the brim with kids and luggage, we really wouldn’t want to be tackling any steep mountain passes, because even motorway overtakes take a whole lot of welly. The other petrol motor is a 2.0-litre unit, found in the Cooper S model. With 189bhp, you might expect it to feel fast. However, the Countryman’s weight means that performance is actually lukewarm. It is at least flexible through the gears, making relaxed progress easy. If you’re after a diesel, you can have a 148bhp 2.0-litre unit in the Cooper D. This offers better performance than equivalent-priced diesel rivals, so it’s the pick of the range. The Countryman is also available as a plug-in hybrid, the Cooper S E, with a three-cylinder petrol engine and an 86bhp electric motor on the rear axle. Off-the-line performance provided by the electric motor is very brisk, but it tails off around 50mph, and the added weight doesn’t do much for the car’s handling. The S E can officially run in electric-only mode for 26 miles, but expect much less in reality. This version makes most sense for company car drivers and those who do mostly short distances. The Countryman is set up to feel sportier than most of its rivals. Its suspension is quite firm and springy, so you feel like you’re always bouncing up and down in your seat. If you opt for bigger wheels or run-flat tyres (a no-cost option), you’ll add harsh bump absorption to that, too. At motorway speeds, it calms down a little, but you find yourself bucking down a typical British B-road and clumsily thumping through potholes and over ridges. You can add adaptive dampers for a very reasonable price, but even these don’t improve matters much. Rivals are far more cosseting. The Countryman also suffers from noticeable tramlining, meaning it finds itself pulling in the direction of imperfections in the road. This requires you to have a strong hold on the steering wheel, especially over broken country roads. The added weight of the plug-in hybrid doesn’t make the ride any better than the standard car’s. Even on seemingly smooth roads, the Countryman picks up surface imperfections and never fully settles down, while on rougher roads (those we’re used to in the UK), the firm suspension struggles even more, with a particularly unforgiving ride over harsher bumps. Mini prides itself on offering ‘maximum go-kart feel’ in all of its cars. To achieve that in a taller, heavier car, the Countryman has been set up to dart into corners with very little steering lock. While that makes sense when charging down a twisting ribbon of road, it can feel twitchy on the motorway. Not only is it a little too fast, but the steering is also very heavy, especially at speeds typical of town driving. This can make manoeuvring more of a chore than it really should be. Four-wheel drive helps the car feel surefooted in poor weather conditions, thanks to the added traction the system provides. Even without the added weight of this, the Countryman always feels slightly cumbersome in the bends, especially if you need to change direction quickly. There’s a surprising amount of body lean and it never feels as agile as the fast steering suggests it will be. The worst of the bunch is the Cooper S E, because the hybrid system adds around 130kg. Although it is slightly better balanced than the regular models, it doesn’t feel anywhere near as agile in fast direction changes and therefore isn’t as much fun. And, due to that heavy battery pack, it leans into faster corners more than the regular Countryman. At least the steering is a little less nervous. The petrol-powered Cooper S revs smoothly while emitting a sporty rasp in keeping with the badge. The engine sounds a bit strained at high revs, but you won’t have to stretch the motor that far under normal driving conditions. The entry-level engine in the Cooper, being a three-cylinder unit, fails to match the Cooper S’s smoother four-cylinder motor when it comes to vibration and noise. And due to that shortage of grunt, you have to keep this unit above 2500rpm to make meaningful progress, compounding its aural intrusion. 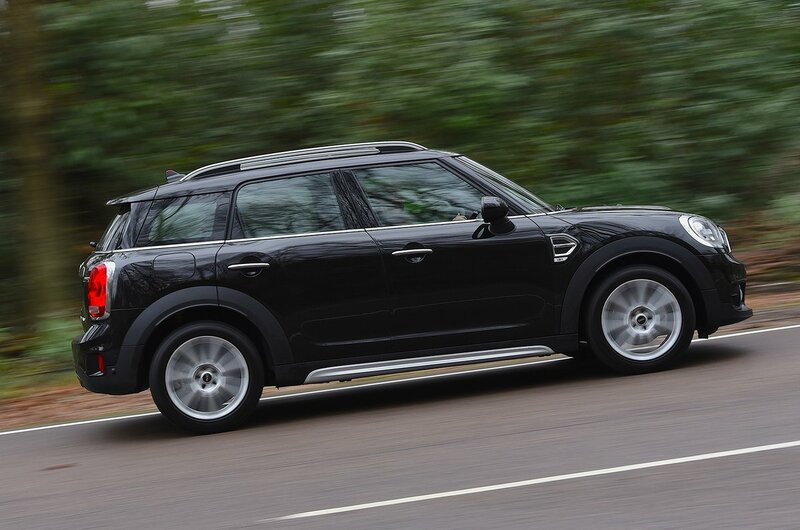 The Cooper D actually has a smoother, quieter and more free-revving diesel engine than many rivals, making it our pick of the Countryman range. Because the Cooper S D has a higher-output version of the 2.0-litre diesel engine, it’s noticeably louder. As you’d expect, the Countryman S E plug-in hybrid is the quietest of the bunch when it’s running on electric power alone, and even when its 1.5-litre petrol engine joins in, the sound isn’t gruff. In fact, the engine and electric motor work together very smoothly. However, road and wind noise are still worse than in rivals. The Mini’s platform is notorious for noticeable tyre noise, and on finely bumped motorway surfaces, this resonates inside at an unnerving volume. The manual gearbox is typical Mini: it slots into gears nicely but has quite a heavy action. There’s a choice of a seven-speed dual-clutch automatic gearbox – available on Cooper and Cooper S – and an eight-speed option in All4 models. The eight-speeder’s shifts are smooth and well timed, but the seven-speed Steptronic unit takes a noticeable amount of time to change down, hindering progress when you’re aiming for a motorway gap.